It was the day after the spring cleaning in this food centre and most of the stalls were still closed including some of my regular choices thus the options were quite limited. 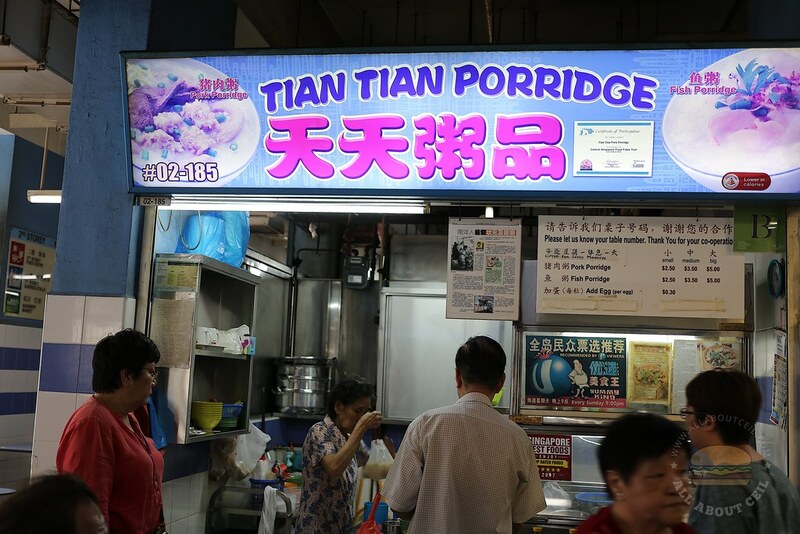 This porridge stall is amongst the pioneer stalls in this food centre and it is still cooked by the white-haired elderly stall owner assisted by an elderly auntie that reminded me of my late Grandma. 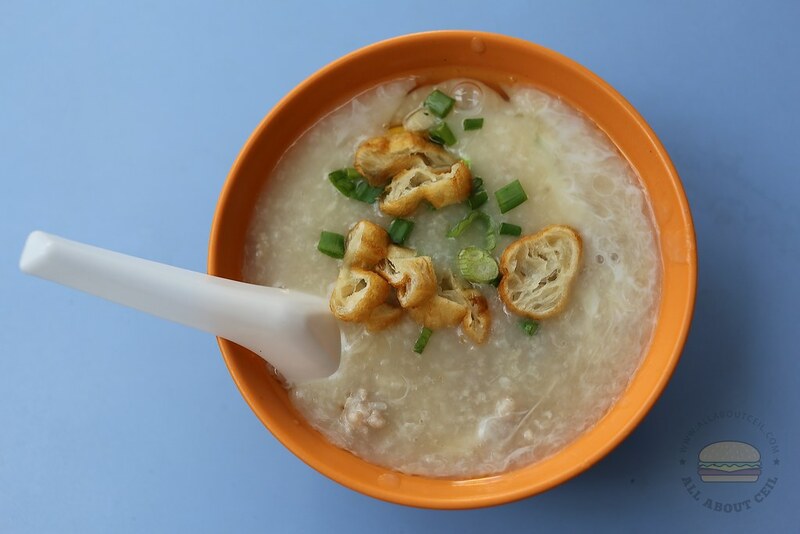 There are 2 choices on their menu, the Cantonese style Fish Porridge and Pork Porridge, available in 3 sizes, the smaller at $3, the medium at $4 and the large portion at $5. They used to serve raw fish but no longer now. The noodle stall beside is related, run by the family members. There was just another customer in front of me at about 11 am. The middle-aged Uncle took my order. He talked with me in Cantonese but when I replied in Mandarin, he started talking with me in a not-so-fluent Mandarin, though not too difficult for me to understand. I wanted to order Pork Porridge, I did not specify the size so it is the smaller portion by default. He asked me, "Everything in?". I nodded. He asked me to take a seat but I offered to wait at the stall for it to be ready. It was ready in about 5 minutes. 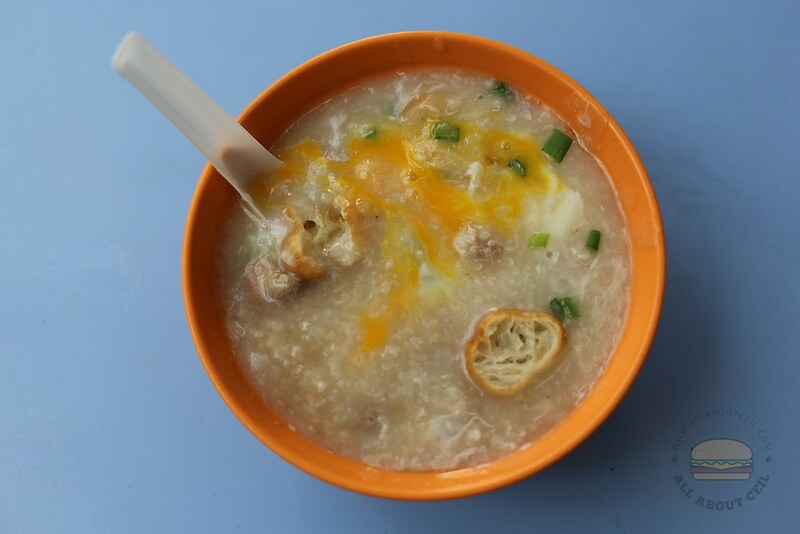 The texture of the porridge was smooth and not too runny with ingredients like minced pork balls, sliced lean meat and pork liver with you tiao. There is something homely and welcoming about this bowl of porridge and I enjoyed it. I went lorong 7 again. The muay seems popular. Have you tried the curry puffs? I might be going to Toa Payoh tomorrow. Do you happen to know the opening hours of that stall? Most of the stalls in that food centre are closed during the day. It was open during lunch time. Have you tried the wanton mee by Chef Kang's Noodle House at Jackson Square? By the way, Lai Heng Mushroom Minced Pork Mee has moved to Block 73 Toa Payoh Lorong 4. Not a fan of lai heng. The reason they are popular is because of the vinegar they use. Take that out, its very ordinary. The broth is not that fantastic also. The best in the north was at the amk 628 market. But owner has retired. It was at blk93 hawker centre, totally forgot about the Jackson square. Maybe go today. I am a big big fan of Joo Heng Mushroom Minced Pork Mee at AMK 628 Food Centre. I can eat there 3 to 4 times per week as I stay near there. They closed quite suddenly and I have yet to find another one that is as good. I am not a fan of Tai Hwa Pork Noodle or any of those that serve with lots of vinegar. Someone posted that he quit because of injuries to his hands. Anyway, chef kang isn't worth the hype. The sauce was bitter. The noodles are nearly identical to the 竹昇面 I had in Guangzhou. The wanton had crunchy water chestnut in it but just a tiny bit and the pork wasn't marinated. You should go Guangzhou and try the food there. Its way much better than those in Hong Kong. Easy to find 潮汕food there too. Since you like teow chew muay, I suggest this https://youtu.be/lqOpWVsowYc the goose liver was like foie gras but much cheaper! I was there too at Chef Kang's Noodle House today. I also think it is very much overrated. I went to eat the curry puff, bought 3 for $2 and a fried popiah, left only the potato and no more sardine. It was warm, the crust still have a slight crisp and the size is quite big too, one of the better ones ever tasted. Thanks for the recommendation. The sardines are much better. I was there before 1 pm but it has already sold out. What would be the best time to go for their sardines puff? Actually is lorong 5 hawker center. I always confused it as lorong 7. The curry puffs are from the dessert stall. Close to the twin cha kway teow stalls.